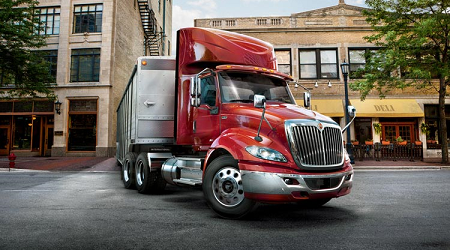 Get more uptime with International Truck! 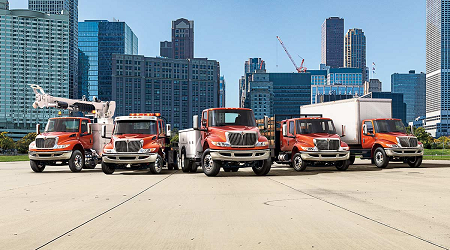 International makes best-in-class, medium- and heavy-duty trucks with unbeatable fuel economy, and offers the support of the largest dealer network out there. You make your best deal—whether you’re buying your first truck or a full fleet—then get up to a $1,000 rebate—over and above! 1. Make your best deal with your International Truck dealer—whether you’re buying your first truck or a full fleet. 2. Submit a copy of the paid invoice(s) to CFS via email, fax, or mail, within 120 days of truck(s) delivery. 3. Rebate payments are made quarterly—it’s that simple! If you are new to Consolidated Fleet Solutions, please complete and send the signed enrollment form along with your invoice(s) or call (866) 630-4222. 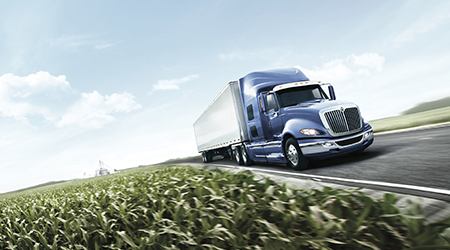 Designed to provide best in class uptime and is the most fuel-efficient on-highway truck we’ve ever built. 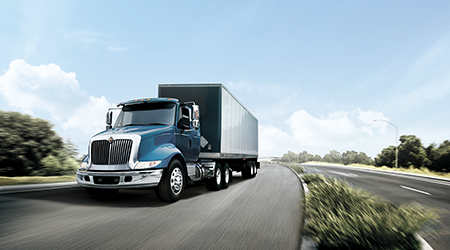 The International® LT™ Series was designed to improve aerodynamic flow in and around the vehicle and optimize fuel efficiency, while the driver-centric design keeps a driver more comfortable and productive for the road ahead. Features all new Premium Gauge Cluster and Bendix® Wingman® Advanced™ collision mitigation as standard. Everything you asked for in a driver’s truck. And beyond. No matter what you throw at it, there's just no stopping a WorkStar. With a broad range of available powertrain options, front and rear axle configurations, framerail options, and more—the WorkStar can muscle its way through even the heaviest loads and the most rugged jobs. 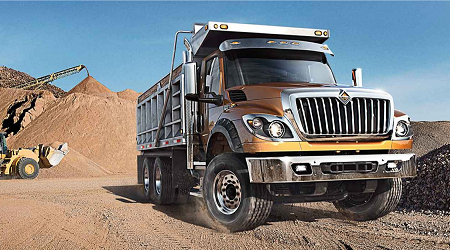 Meet the most agile regional haul truck to hit the streets. 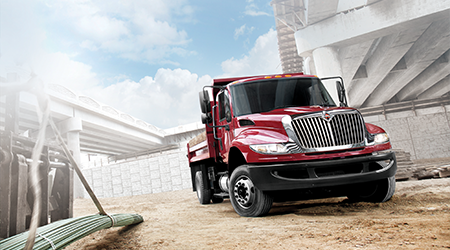 The International® RH™ Series navigates the city and your business with ease through exceptional maneuverability. The standard wide track front axle provides a curb-to-curb turning radius of 27 feet 10 inches for greater agility navigating streets and alleys. 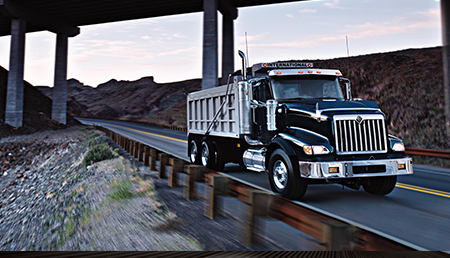 Featuring increased uptime and DriverFirst™ controls, the RH™ Series is built with you in mind. Some trucks work. The HV™ Series works smarter. Designed with safety and visibility in mind, by reshaping our doors, repositioning cab mirrors, and offering a low rake windshield, we've improved the driver's field of view and reduced head turn angle, thus reducing vision-related accidents. Combined with the largest cab in its class and an all-new HVAC system with max defrost, the HV™ Series is DriverFirst™ in every way. Designed to outwork and outlast, these build-your-own trucks are made for Dumping, Concrete mixing, Heavy Hauling, and Crane carrying. 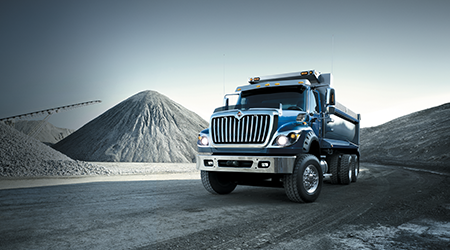 The International® HX™ Series offers the industry’s only dedicated, severe service aluminum cab with riveted and bonded lap seams for increased strength and easier repair. Features include a 40-degree wheel cut with 425 tires, dual steering gears, and advanced ABS systems that allow for sharp turns, traction, and movement control. The 150,000-lb. capacity center tow pin is for extreme recovery scenarios. There’s so much more to this truck series—build your own today! The LoneStar has classic good looks inspired by International trucks of days gone by, but it’s more than just eye-candy. It boasts the quietest cab in its class and at 89" wide, it's also one of the roomiest. 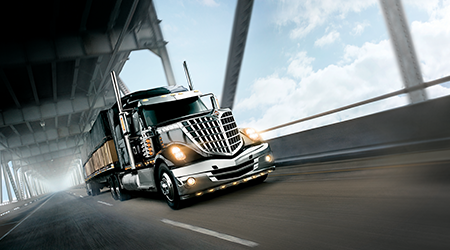 A 50-degree wheel cut and roll stability control allow you to maneuver the LoneStar in and out of traffic with ease. The 9900i delivers both style and performance—it begins under the hood with the high horsepower Cummins ISX15, providing the brute power needed to haul the heaviest of loads with fuel economy that your bottom line will appreciate. And comfort will never be an issue with features like the iconic Eagle interior, extra-wide bunk, and easy-to-read gauges and switches. 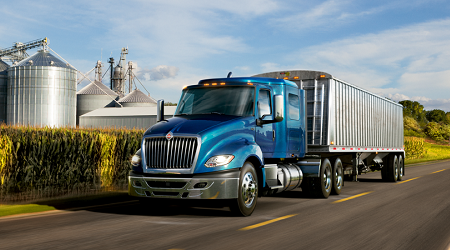 ProStar is a driver's truck—the most efficient and innovative Class 8 truck on the road, in fact. 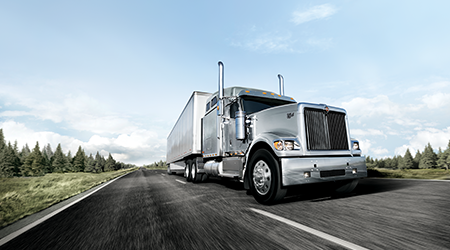 When purchased with the newest ProStar ES fuel-efficiency package, it’s the perfect balance of superior aerodynamics and drivetrain optimization. Thanks to incredible maneuverability and clear sight lines, the TranStar can take you anywhere your business needs to go. With a setback axle and 50-degree wheel cut, it boasts the tightest turning radius in the business. Powered by the Cummins Westport ISL G or N13 engine, TranStar gets around effortlessly and reliably. PayStar combines unmatched strength with unequalled durability to meet any challenge you can throw at it. On- or off-highway, no job is above its pay grade. Wherever you find trucks being called upon to perform above and beyond the call of duty, you'll find a PayStar leading the way. With a wide range of applications and a focus on connectivity, the MV™ Series works to your advantage by giving you quality you can depend on—day in and day out. 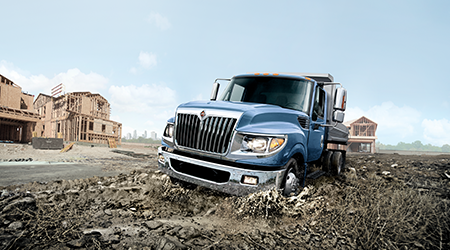 The superior combination of uptime, DriverFirst design, and maximum cab-axle flexibility makes the MV™ Series the ultimate work truck in its class. 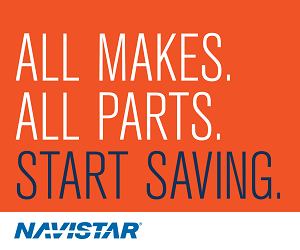 Count on DuraStar to help you tackle any job. Equipped with the reliable Cummins ISB6.7 and Allison Rugged Duty Series transmission, the DuraStar is spec’d for construction. 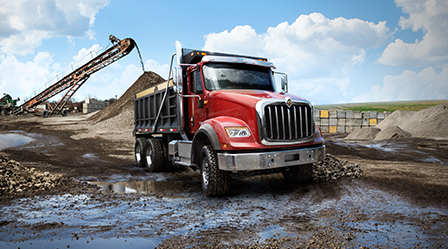 It maximizes uptime so you can finish the job right on schedule. Few trucks are as ready to get down and dirty as the TerraStar. That’s because it was built from the ground up to be the ultimate commercial-duty truck. Compared to the leading competitor, it offers 7" more interior width, 9" more headroom, 2" more belly room, and more. *Offer valid September 16, 2015 – December 31, 2019. Incentives cannot be combined with any other national incentive/rebate program. Limit of 10 units per customer per calendar year. 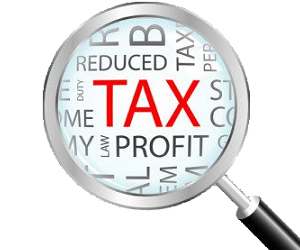 Rebates will be fulfilled by Consolidated Fleet Solutions (CFS). Documents required for confirmation of truck purchase include a copy of the paid invoice and must be submitted within 120 days of DTU to CFS. CFS is a nationwide buying services program that meets the needs of light, medium, and heavy-duty fleets.